Dan Tuohy rises highest in Ulster’s defeat to Leinster last weekend. (c) Ken Bohane. Declan Kidney has picked four second-rows in his squad to tour New Zealand: Donncha O’Callaghan, Dan Tuohy, Donnacha Ryan and AN Other. Paul O’Connell will take that AN Other slot if he recovers from a knee injury as expected. Devin Toner is unlucky to miss out, as is Mike McCarthy. If he is fit, then O’Connell is obviously one of the first names on the team sheet. I’m confident that he won’t miss this tour. So who should pack down alongside POC in that first test on the 9th of June? The battle for the second-row could be one of the tightest calls Kidney has to make. 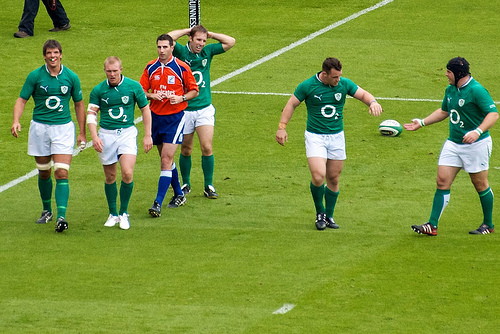 The continued selection of O’Callaghan during this year’s Six Nations was the foundation of much of the criticism aimed at Kidney. It was certainly justified. The fact that O’Callaghan hasn’t been commanding a starting place at Munster, coupled with the form of Ryan, Tuohy, McCarthy and Toner made it hard to understand. Kidney’s loyalty has been infuriating for Ireland’s supporters, and O’Callaghan is prime evidence for the accusations. First off, let me say that I’m not a fan of slagging off individual players. Donnacha O’Callaghan has been a legend for Munster and Ireland. He clearly cares passionately about playing for both teams and it’s obvious that he gives 100%. At his peak he was hugely effective. But he’s now 33 and is past that peak. If that’s so obvious the majority of Ireland fans, then why does Kidney keep picking him? There must be something behind this other than blind loyalty. O’Callaghan has been a true stalwart for Munster and Ireland. (c) Liam Coughlan. Trying to get inside the mind of Declan Kidney is not an easy thing to do. Clearly his decision to keep faith in O’Callaghan is swayed by their previous shared successes. Kidney also probably feels that O’Callaghan gives his pack a better balance. With ball-carriers in Healy, O’Brien, Ferris and to a certain extent O’Connell and Heaslip, Kidney probably feels that a workhorse like O’Callaghan is necessary if there’s going to be anyone committing to rucks. O’Callaghan is probably a good scrummager too, particularly if you judge from his attempts to give Tom Court some helpful advice during the Twickenham Demolition. If that’s the case, and O’Callaghan does give a serious shove from the second-row, then it may go a little further to explaining why Kidney chose him during the Six Nations. But the time has come for O’Callaghan to step aside. The simple fact is that Ryan and Tuohy can do everything that O’Callaghan does, and plenty more. Ryan will feel that he has earned the starting role alongside O’Connell after his Six Nations displays. He added serious aggression and bite to Ireland’s game each time he played (2 starts, 3 off the bench). Allied to that, the Tipperary man has finally nailed down a definitive starting role at Munster at the age of 28. Ryan surely believes that he has done everything in his power to be named in Ireland’s XV for that first test against the All Blacks. Ryan had an impressive Six Nations in what has been a real breakthrough season. (c) Ivan O’Riordan. Ulster lock Tuohy has been excellent for his province for the entire season. His ball carrying has been increasingly dynamic, his lineout work superb, and he can offload too. The Bristol-born second-row would have been aggrieved that Kidney called up Connacht’s Mike McCarthy as bench cover when O’Connell picked up a knee injury during the Six Nations. The fact that McCarthy had the most recent international exposure was the deciding factor, as appears to be be the case very often with Kidney. Tuohy kept his head down and continued to excel for Ulster as they earned their place in last weekend’s Heineken Cup final. The 26-year-old was one of Ulster’s standout performers in the 42-12 loss. He made his tackles, hit rucks and secured lineout ball without fuss. On top of that he carried powerfully, something O’Callaghan doesn’t do. The manner in which he bounced off a Sean O’Brien tackle was a surprising and welcome highlight. To top off a strong all-round display, Tuohy popped up out wide to finish after Paddy Wallace’s intelligent offload. Ryan and Tuohy are the men with momentum and confidence behind them. O’Callaghan’s days as a first-choice international lock are surely now at an end, despite his inclusion in the squad to tour NZ. O’Connell’s complete skills mean that whichever of Ryan or Tuohy are picked, Ireland’s second-row will still have balance. Personally, I’d go for Tuohy and O’Connell for the first test, with Ryan giving versatility and a real impact off the bench. Would you go for Tuohy or Ryan? Are there any O’Callaghan fans out there? If O’Connell doesn’t recover, would a second-row of Tuohy and Ryan work? As always, feel welcome to leave a comment with your views! Photos courtesy: Liam Coughlan, Ken Bohane, Ivan O’Riordan. O'Connell won't be leading Munster out tomorrow night. (c) Ivan O'Riordan. Another chapter of one of sport’s great rivalries will be written in Thomond Park tomorrow night. While there’s no immediate reward at stake for this battle, there is plenty to play for. Munster’s need for a win appears to be far greater. We’re into the real business end of the season, with the HC quater-finals to come the weekend after this. While a Leinster loss tomorrow would be a blow for them, failure at home could have catastrophic effects for Munster. Picture it: a Munster loss at home just 8 days before that massive quarter-final against an Ulster side who have no fear of Thomond Park. How would it affect the side’s confidence knowing that they had failed against even bigger rivals the weekend before? The consequences would reach further than the Heineken Cup too. 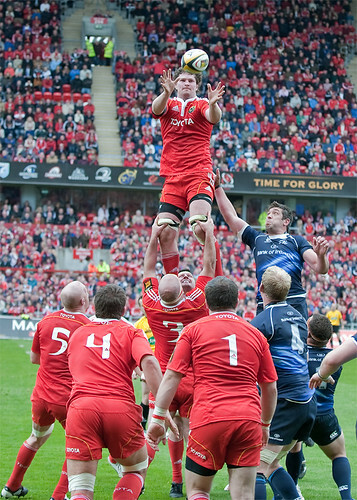 Munster’s next three PRO12 games are against the Warriors (h), Scarlets (a) and Ulster (h). All three of those sides are still play-off contention. A loss to Leinster tomorrow puts Munster right back in the thick of that battle. A win would allow some breathing space. Would a loss effect Leinster as much? On the surface, no. They currently have an 8-point lead over Munster at the top of the PRO12. Losing tomorrow would have no effect on their league position, while two of their final three fixtures are very winnable (Edinburgh at home and Dragons away). 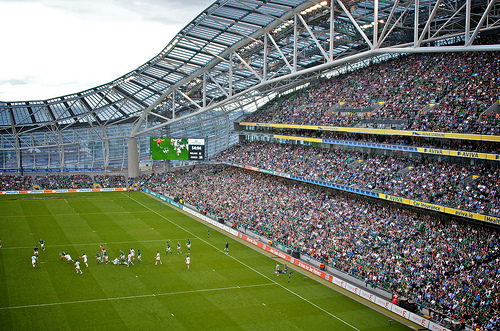 Next weekend’s quarter-final at the Aviva is against the Blues, who will be boosted by Wales’ Grand Slam. Still, betting against Leinster in that one won’t be on too many people’s agenda. 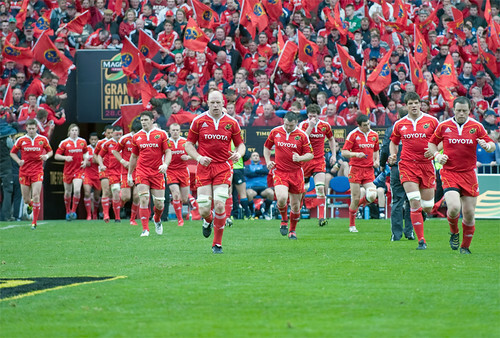 A defeat to Munster is never welcome, but the fact that the game is in Thomond Park would reduce any ill-effects. Kearney returns for Leinster at fullback. (c) Ken Bohane. As if Munster’s mission was already not difficult enough, this season’s leading lights of O’Connell, Ryan and Murray have all been ruled out through injury. These losses will be as keenly felt as POC and BOD’s were by Ireland during the Six Nations. Others will now have to step up as Ryan for Ireland. He would have relished this game, still with something to prove after starting only two Six Nations games. Who will provide the leadership without O’Connell? Who will provide the aggression without Ryan? Leinster’s deck of cards is almost full with the return of their complement of internationals. After some patchy form recently, Joe Schmidt will be keen to get back to their glorious December heights ahead of next weekend’s quarter-final. Last season, Munster got back on top of this rivalry with a narrow 9-13 loss in the Aviva being followed by a 24-23 win in Thomond Park and that 19-9 Magners League Final win. Their only meeting this season resulted in a 24-19 win for Leinster in the Aviva. Elsewhere, Ulster are in action tonight against bottom side Aironi. It’s a good chance for Brian McLaughlin’s side to secure a try-scoring bonus point in Ravenhill and keep themselves in contention for a play-off spot. Stephen Ferris, Rory Best and Andrew Trimble return to the side after their Six Nations involvement. Interestingly, McLaughlin has gone for Lewis Stevenson in the second-row ahead of Dan Tuohy, who has had a great season up to this point. 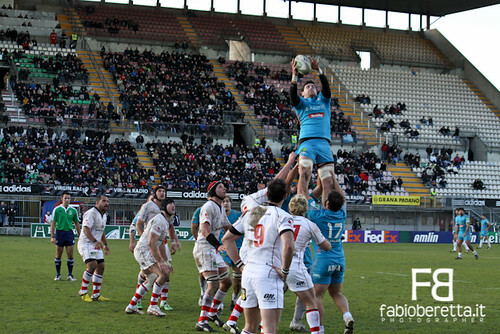 Ulster have already beaten Aironi 3 times this season, twice with bonus points. (c) Fabio Beretta. McLaughlin has stated that a number of places are still up for grabs ahead of next weekend’s quarter-final in Thomond Park. Tuohy will be devastated if this is an indication of his coach’s thinking before that Heineken Cup outing. A bonus point tonight looks even more important when you look at Ulster’s three remaining PRO12 fixtures, where they face three inter-pro derbies in a row: Connacht (a), Leinster (h) and Munster (a). Connacht also play tonight as they travel to take on a Dragons side who have enjoyed a superb turn-around of form recently. They’ve won 4 of their last 5 games, and welcome back Grand Slam trio Dan Lydiate, Toby Faletau and captain Luke Charteris for this game. The pressure is on Eric Elwood to finish this season with a few more Connacht wins. It would be disappointing to let the season simply peter out. 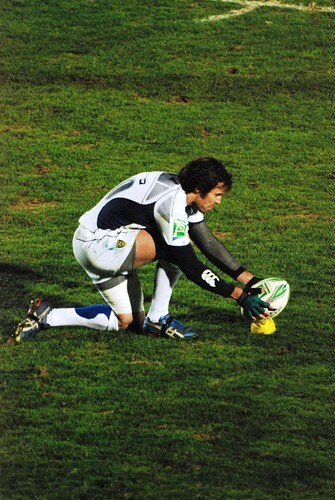 This week brought more good news for Connacht ahead of next season with the announcement of Willie Faloon’s signature. The 25-year-old openside joins from Connacht with plenty to prove. He will relish the opportunity for more game time at the western province. Along with Dan Parks and Nathan White, Faloon should help improve this inconsistent Connacht team. It’s another PRO12 weekend with so much at stake. Enjoy! Photos courtesy: Ivan O’Riordan, Ken Bohane, Fabio Beretta. POC is out, leaving a second-row gap and a captaincy gap. (c) Art Widak. The disappointment of Paris will linger ahead of this weekend and that is where the motivation will come from. Sunday afternoon saw a refreshing aggression, particularly in the first-half. That edge was notably missing against Wales and Italy. As with all of Ireland’s big performances in recent times (think Oz at RWC2011 and England 6Nations 2011), aggression is the key. The challenge now for Kidney is to ensure that his team take to the Aviva pitch on Saturday similarly motivated. Team selection is an issue again this week. The loss of Conor Murray and Paul O’Connell is obviously a big blow. The scrumhalf was close to his physical best against France before suffering that horrendous-looking knee injury. O’Connell was again magnificent, somehow disguising a pretty bad knee injury from everyone. His level of consistency is remarkable. Reddan in for Murray is a switch that many had called for in the build-up to Paris, and now we will see if his uncomplicated delivery does actually put Johnny Sexton on the front foot. The selection of Tomas O’Leary as cover at scrumhalf is a baffling one. Surely this was a chance for Kidney to have a look at Ulster’s Paul Marshall, a man whose form has pushed Ruan Pienaar to outhalf. Kidney’s loyalty is hugely frustrating at times and this is one of them. O’Leary has been far from his best this season and hardly deserving of an international call-up. Isaac Boss was the other natural choice, but the word is that the Leinster scrumhalf is back in New Zealand this week and so, unavailable. Kidney has some big decisions to make this week. (c) Art Widak. Connacht’s Mike McCarthy has been given the call to cover in the second-row. Dan Tuohy of Ulster had a good chance too, but McCarthy is the more recently capped of the pair and has been more heavily involved in Irish squad training this season. The obvious change to the first 15 would see Donnacha Ryan slot into O’Connell’s vacant position. However, there is a case for McCarthy’s inclusion from the start. 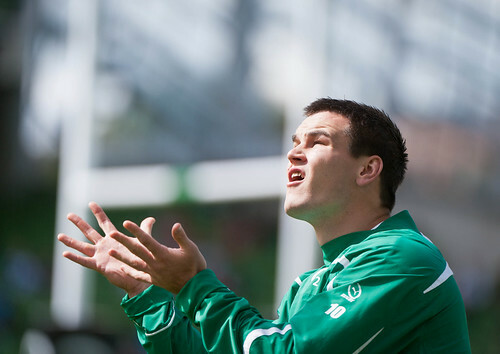 He is a natural number 4 jumper and calls the lineout shots for Connacht. Both Ryan and O’Callaghan jump at 2, and neither calls lineouts at Munster. In Declan Kidney’s risk-free mind, McCarthy may look like the safe choice. Elsewhere, the back-row has once again come under scrutiny. Sean O’Brien and Stephen Ferris both had big, physical games, particularly in defense with some trademark choke tackles as well as a couple of big hits. O’Brien was crucial to Tommy Bowe’s second try with his intelligent screen pass to Johnny Sexton. Intelligence is probably not associated with O’Brien’s play too often but he deserves more credit in that department. Jamie Heaslip was the quietest of the back-row trio and if Kidney decides to unleash Peter O’Mahony from the off, the Leinster No.8 may be the one to miss out, with SOB moving to the base of the scrum. The centre partnership put in a good display on Sunday, one mistake each aside. They were very solid in defense, with the one exception being Fofana’s try, when Earls’ wild hack at the ball on the ground was the wrong decision. However, the Munster man did very well for the second Bowe try, straightening the line intelligently after Ferris had eaten up a lot of space with his lateral run. Earls looked comfortable in the 13 jersey. D’Arcy had that one bad knock-on in the French 22 when his intended pass hit his own hip. He worked very hard in defence though, especially at the breakdown. Is there a captain amongst these men? (c) Art Widak. It’s hard to see changes anywhere else on the team. Andrew Trimble didn’t enjoy the best of games and there might be a case for Fergus McFadden being included. That’s unlikely though as Kidney will look to build on the impressive first-half showing from his team. The truth is that France had a lot more possession but when we did have the ball we looked to have a bit more attacking shape and confidence. That all stemmed from the early aggression, leading to some big hits and choke tackle turnovers. The confidence built from those plays was infectious. Seeing Bowe back himself so assertively was exhilarating and exactly what you want from your wide men. Once again, Rob Kearney was the best player on the pitch. The uplifting effect of the kind of fielding game he offers is easy to see. As those who have played the game will know, a big catch in opposition territory is inspirational. Kearney’s confidence, built on the back of a brilliant season for Leinster is becoming so important to this team. The final issue is the captaincy. Rory Best has been in great form up front, and has experience of captaining Ulster. Jamie Heaslip has captained Leinster, and was once seen as a possible Irish captain in waiting. Stephen Ferris’ form might make him a candidate. And then there’s Rob Kearney. The thought of the fullback captaining Ireland hadn’t really occurred to me until pointed out by a knowledgable friend. But the idea has grown, and his inspirational play and respect within the squad might make him the compelling choice. Sexton is fit to take his place at outhalf. (c) Nigel Snell. Declan Kidney has unveiled his Irish team to take on Italy in Saturday’s Six Nations game at the Aviva (kick-off 1.30). 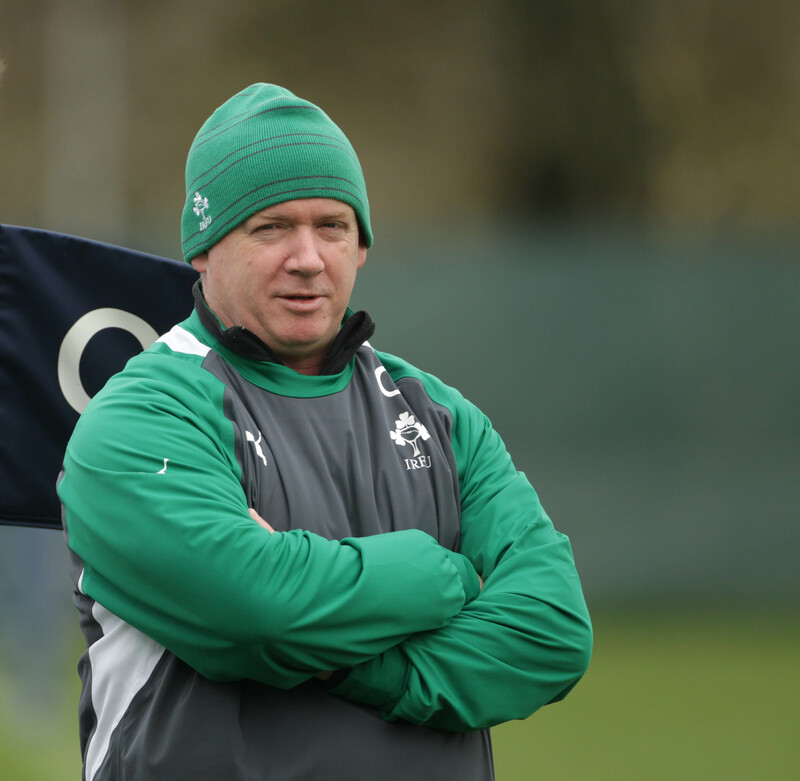 The Irish coach has made no changes to the side he had originally selected to take on France. Johnny Sexton has fully recovered from the thigh injury which made him a doubt for the ill-fated Stade de France clash two weekends ago. Italy have been poor in their first two games against France and England. They don’t look to pose any more threat than usual. This is an Irish team filled with quality players and they should be confident of a convincing win at home. What’s your take on the Irish team? Would you have liked to see a few changes? If so, where and who? How do you think we will fare against the Italians? Comment below with your views and opinions on the Italy match this weekend. Ireland take on Wales at the Aviva on Sunday. (c) Ross Wynne. Declan Kidney and his management team today announced a 32-man squad for the final week of training before Sunday’s Six Nations opener with Wales at the Aviva. Kidney will pick his match day 22 for Sunday from this extended training squad. 23 of last week’s 24-man senior training squad have been retained, with only James Coughlan dropping out. Dan Tuohy, Simon Zebo, David Kearney, Eoin O’Malley, Brett Wilkinson, Chris Henry, Denis Hurley and Rhys Ruddock have all been promoted from the Wolfhounds squad. 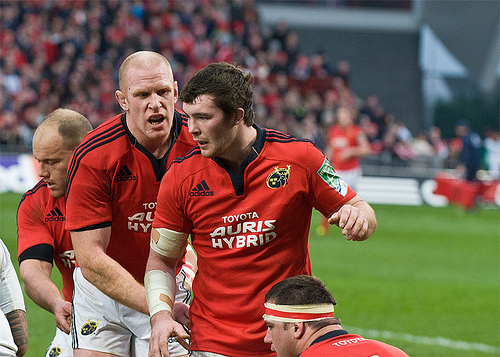 Munster’s Peter O’Mahony is the only of last week’s ‘additional players’ included this week. 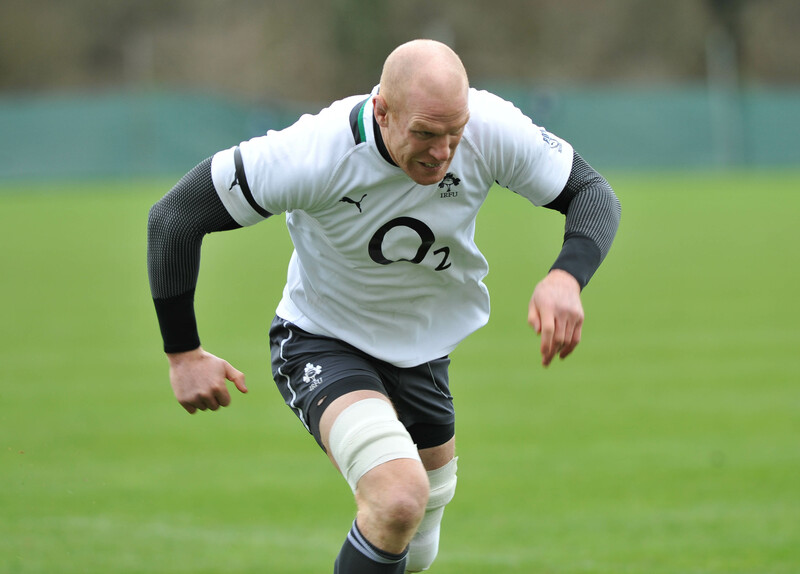 Forwards (17): Rory Best, Sean Cronin, Cian Healy, Mike Ross, Tom Court, Brett Wilkinson, Paul O’Connell (capt. ), Donncha O’Callaghan, Donnacha Ryan, Dan Tuohy, Stephen Ferris, Peter O’Mahony, Shane Jennings, Sean O’Brien, Chris Henry, Jamie Heaslip, Rhys Ruddock. Backs (15): Conor Murray, Eoin Reddan, Jonathan Sexton, Ronan O’Gara, Gordon D’Arcy, Paddy Wallace, Fergus McFadden, Eoin O’Malley, Keith Earls, Tommy Bowe, Andrew Trimble, David Kearney, Simon Zebo, Rob Kearney, Denis Hurley. Kidney will hope Sean O'Brien is at his destructive best this weekend. (c) Ross Wynne. After the initial burst of criticism aimed at Kidney’s conservatism, this squad actually has a relatively fresh look to it. While it would still be a surprise to see someone like Zebo or O’Mahony actually make the match day squad, it’s encouraging that Kidney has followed through on his assertion that any players who performed well for the Wolfhounds would be considered for the senior side. If Kidney had originally named this selection as his Six Nations squad, there would have most likely been a positive reaction. That said, there are certainly still areas of the squad that some will disagree with. The inclusion of Donncha O’Callaghan over Mike McCarthy would appear not to be based on form. James Coughlan’s absence might also provoke some dissent. However, the time for discussions on who should have been included in the squad is now over. This is the pool of players from which Kidney will (or most likely already has) select his match day 22 for Sunday. That announcement will come at lunchtime on Wednesday. Whatever way Kidney goes, it’s going to be a fascinating match with Wales. The anticipation is rapidly building. 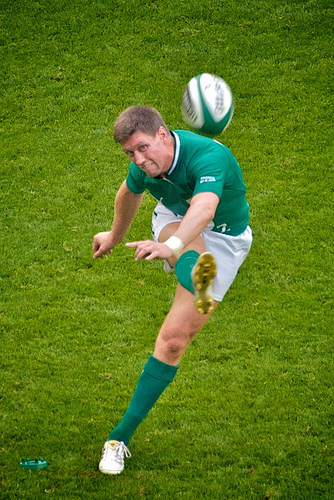 Ronan O'Gara is back for another 6 Nations campaign with Ireland. (c) Ross Wynne. The Irish management team today announced both the Irish senior squad for the forthcoming 6 Nations and the Irish Wolfhounds squad for a game with the English Saxons in two weekend’s time. The senior squad includes 24 players, plus an additional 6 players who will join the first week of training. The Wolfhounds squad features 22 players. Forwards (13): Rory Best, Sean Cronin, Tom Court, Cian Healy, Mike Ross, Leo Cullen, Donncha O’Callaghan, Paul O’Connell (capt. ), Donnacha Ryan, Stephen Ferris, Jamie Heaslip, Shane Jennings, Sean O’Brien. Backs (11): Conor Murray, Eoin Reddan, Ronan O’Gara, Jonathan Sexton, Gordon D’Arcy, Paddy Wallace, Fergus McFadden, Keith Earls, Tommy Bowe, Andrew Trimble, Rob Kearney. 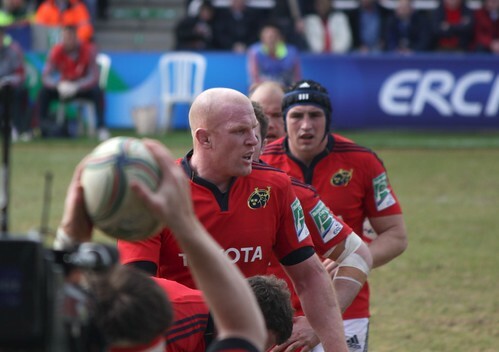 Additional Players (6): Ian Nagle, Peter O’Mahony, Tiernan O’Halloran, Paddy McAllister, Andrew Conway, Simon Zebo. Peter O'Mahony is one of 6 "additional" players named by Declan Kidney. (c) Ivan O'Riordan. Forwards (12): Stephen Archer, Ronan Loughney, Mike Sherry, Damien Varley, Brett Wilkinson, Mike McCarthy, Devin Toner, Dan Tuohy, Kevin McLaughlin, Chris Henry, John Muldoon, Rhys Ruddock. Backs (10): Isaac Boss, Tomas O’Leary, Ian Madigan, Ian Keatley, Nevin Spence, Eoin O’Malley, Luke Fitzgerald, David Kearney, Gavin Duffy, Denis Hurley. Brian O’Driscoll, David Wallace, Darren Cave, Felix Jones, Jerry Flannery, Eoin Griffin, Denis Leamy, Niall Ronan. 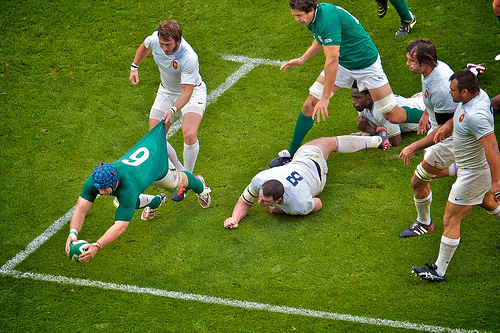 Luke Fitzgerald, pictured scoring against Bath, is in the Wolfhounds squad. (c) Art Widak. Before we start criticising Declan Kidney’s senior squad for being too conservative, which it clearly is if looked at as a definitive final squad, it’s worth noting that Kidney has emphasised that players in the Wolfhounds squad are still in consideration for his matchday 22 to play Wales. The Wolfhounds take on the Saxons on the 28th of this month, giving those players a final chance to impress ahead of the Wales clash on the 5th of February. It’s unclear why Kidney did not simply name a 30-man senior squad, instead of marking the 6 young players as “Additional players”. This promising sextet will have just one week of training with the senior squad to impress. Surely if someone like Peter O’Mahony puts himself about to good effect in that week of training he will be considered for a place on the bench against Wales? Why bother to mark these guys as “additional”? He has left himself open to criticism for not blooding younger players that would have been avoided by simply naming those 6 players in the squad. It may be confusing, but at least Kidney is keeping the door open for the Wolfhounds players. At the squad announcements he said, “The Wolfhounds game gives myself and the other coaches one final chance to give games to players to see possible options before we settle on our matchday 22 for the opening game of the Championship.” That will be encouragement enough to ensure that the Wolfhounds game is treated seriously, a final trial of sorts. So what of the player selections Kidney has made? The fact is that any of the 52 players he and his management have named could be in the squad for the Wales game. Until he names that matchday 22, it’s hard to criticise or praise. But of course, being named in the senior squad is a better indicator that a player will be involved. O'Callaghan, Earls, Healy and Ross are all in the senior squad, while O'Leary (centre) is amongst the Wolfhounds. (c) Ross Wynne. In terms of second-rows, Dan Tuohy and Mike McCarthy have been in fantastic form for Ulster and Connacht respectively. 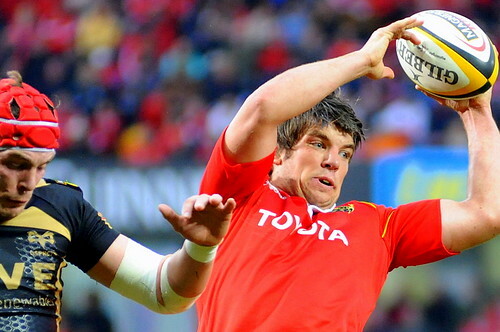 Donncha O’Callaghan is named in the senior squad despite slipping behind Donnacha Ryan in the Munster pecking order. Tuohy and McCarthy will feel aggrieved at Kidney’s loyalty in O’Callaghan, especially with the Munster man now 32. Luke Fitzgerald is one name noticeably missing from the senior squad. However, he hasn’t played in the last two weeks because of slight glute/neck problems. It looks as if he will be given the Wolfhounds match to prove his fitness before being considered for the 6 Nations matchday squad. His form this season demands inclusion. Elsewhere, the form of Ulster’s Paul Marshall and Conor Gilroy has been ignored completely as neither features at all. It would be fantastic to see younger players like Tiernan O’Halloran and Peter O’Mahony getting a chance in this year’s 6 Nations, even if only off the bench. However, with the squads he has named, the feeling is that Declan Kidney will stick with the tried and trusted. Photos courtesy: Ross Wynne, Ivan O’Riordan, Art Widak.